Excellent food, very relaxed atmosphear. Must go location. great food but not vegetarian friendly unfortunately! The food, service and drinks were amazing and super tasty. There was not a single thing we could complain about. Also the prices are affordable. A must try out!! Lovely food, great service and good prices, what more could you want? Sweet staf and Nice food. Nice, small place with really good food. The ambiance is pleasant and the service is fast and kind. The menu is small, however everything on it is really tasty, so that's not a problem at all! 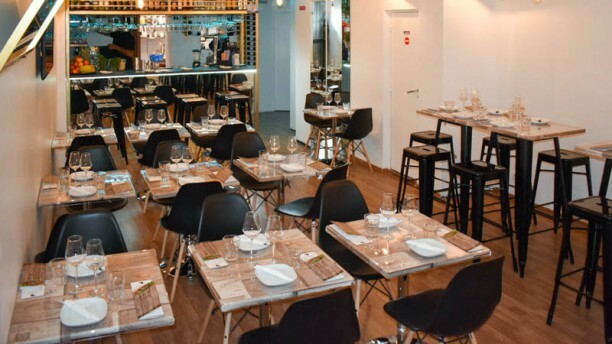 Very friendly staff and nice small restaurant located in the heart of Bairro Alto. The choice of Tapas could have been larger but the taste was good and the prices were really cheap! Great service and food. Would definitely recommend this place. Loved the atmosphere. Finally a place with professional and super friendly service! Fast, kind, caring, efficient, rare to find such level of service in Lisbon.. we loved the food everything freshly prepared and delicious. Awesome sangria and chicken quesadillas we even repeated... very reasonable prices and absolutely loved the African music playing!!!! Definitely a new favourite spot. Really nice staff, perfect food. Amazing!!! 10/10! Brilliant tapas bar. Food delicious. Food was great, service even better! I know that when one dines alone, the table could have gone to two or three eating (and paying) guests. But I did not feel rushed or treated with less attention than other large parties present. For service and smiles alone I would return next time! At Leve Leve you’ll find really great food and a warm and friendly service, even some birthday drinks. It‘s highly recommendable to find your way to Leve Leve.